Can you believe it – spring is right around the corner (whether it feels like it or not)! Luckily we have the upcoming ProMat Show to look forward to. Taking place March 23-26 at McCormick Place in Chicago with 300,000 sq. feet of space completely sold out, this should be a better opportunity than ever to learn about the latest developments in automation and industrial technology. 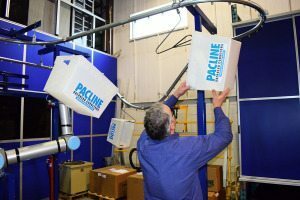 As an exhibitor, Pacline Overhead Conveyors will be among the 700 material handling and logistics providers from over 110 different countries to showcase their products. We hope you will visit us at BOOTH #959. Our engineers will be on hand to discuss ideas and solutions to help you take the next step in automation. Whatever the size of your operation there are always ways to improve efficiency and productivity through better automation. 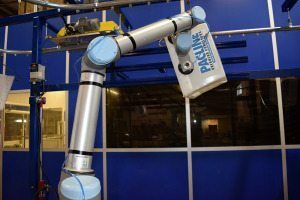 This could mean upgrading from a manual conveyor system to a powered line, integrating robotics with a powered line or even installing your first conveyor system. From our point of view, the future of material handling is automation and the integration of technologies including the use of simple robots which will take the repetitive tasks away from workers allowing the workers to focus on more challenging tasks resulting in overall improved efficiency and productivity. This year at ProMat, we are focusing on automation for warehouses and distribution centers. For split case (or less than carton) picking operations, we will show you how to take Empty Carton Handling UP a level. Our engineers will be demonstrating a material handling system for the automatic loading and unloading of empty cartons and totes to and from a moving overhead conveyor. 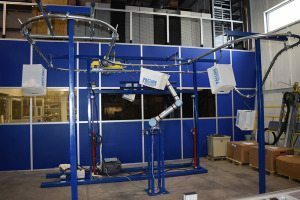 This system utilizes our signature enclosed track chain conveyor combined with a unique robot. 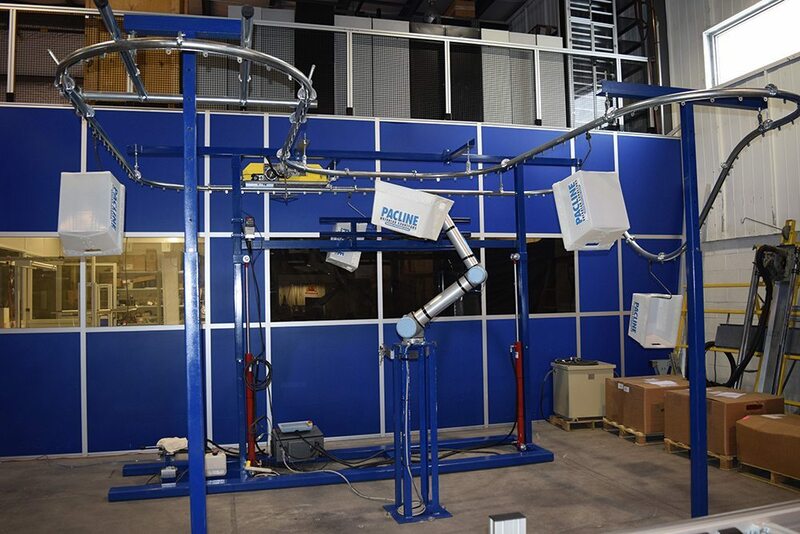 This UR10 Universal Robot™ provided by INTERCON Material Handling Automation represents a modern, employee safe, “collaborative” design that is easy to use, cost effective and will serve to reduce labor costs thereby providing a solid return on investment. Be sure to follow us on twitter @PaclineConveyor, for more exciting updates – we will be ‘live-tweeting’ from the show in Chicago! Don’t forget to visit us at BOOTH #959 or contact a PACLINE engineer to discuss new ideas to improve productivity for your split case picking operation or other applications. As well, you can register for the show for free by clicking here.